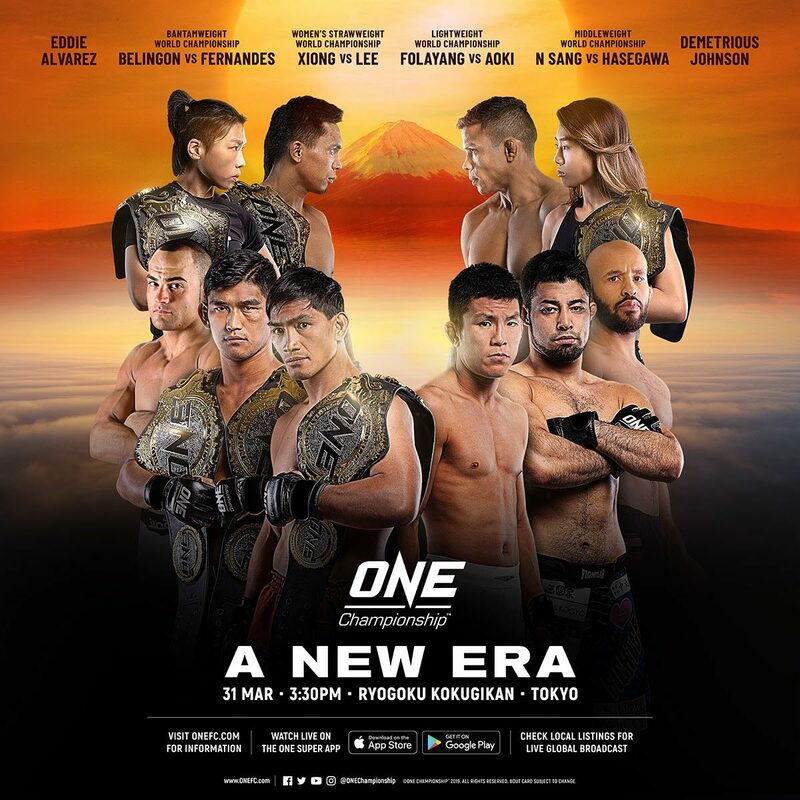 The largest global sports media property in Asian history, ONE Championship™ (ONE), has just announced the complete card for ONE: A NEW ERA, which is set for Sunday, 31 March at the iconic Ryogoku Kokugikan in Tokyo, Japan. Ticket information for ONE: A NEW ERA is available at www.onefc.com and on LINE Ticket at https://ticket.line.me/sp/ONEChampionship, as well as Kyodo Tokyo, Ticket Pia, Lawson Ticket, and E-plus. In the main event of ONE: A NEW ERA, reigning ONE Lightweight World Champion Eduard “Landslide” Folayang of the Philippines is set to face Japanese martial arts legend and former World Champion Shinya “Tobikan Judan” Aoki in a long-awaited rematch. In November 2016, Folayang captured the ONE Lightweight World Title from Aoki via third-round TKO, but surrendered the belt to Martin Nguyen a year later. This past November, Nguyen vacated the title and the Filipino reclaimed the crown with a dominant five-round unanimous decision over Singaporean knockout artist Amir Khan. Meanwhile, Aoki is riding a three-bout win streak, having finished Rasul Yakhyaev and Ev Ting by submission, and stopping Shannon Wiratchai by TKO. These three wins have elevated the Japanese icon to another shot at the ONE Lightweight World Title, as well as a chance to defeat his former conqueror. Also, there will be a trio of co-main events. In the first co-main event, reigning ONE Women’s Strawweight World Champion “The Panda” Xiong Jing Nan will defend her belt against ONE Women’s Atomweight World Champion “Unstoppable” Angela Lee. The two martial artists sit at the top of their weight classes, and each has dominated their respective divisions. However, with Lee moving up in weight to challenge Xiong for the strawweight crown, the Singaporean has the chance to become the first two-division women’s World Champion in ONE Championship history. It certainly will not be easy, as “The Panda” represents the toughest challenge in Lee’s career. In the night’s second co-main event, reigning ONE Middleweight and Light Heavyweight World Champion Aung La “The Burmese Python” N Sang will defend the middleweight crown against Japan’s Ken Hasegawa. Aung La N Sang’s first encounter with Hasegawa in June 2018 was a five-round thriller of epic proportions, one which the Myanmar sports icon won in the final moments of the heated battle. The match is considered the “Greatest Bout In ONE Championship History” and was also awarded “Bout Of The Year” honors at the 2018 Global Martial Arts Awards for its nonstop action and dramatic finish. Aung La N Sang and Hasegawa will meet once again in a highly-anticipated rematch that is sure to produce fireworks. In the last co-main event of the evening, ONE Bantamweight World Champion Kevin “The Silencer” Belingon of the Philippines will defend his championship against former titleholder Bibiano “The Flash” Fernandes of Brazil in a trilogy match. The two competitors first met in January 2016, when the Brazilian made quick work of the Filipino, whom he finished via first-round submission. Belingon was unable to showcase much of his striking, as it was easily nullified by Fernandes’ vaunted grappling. From there, Fernandes continued to establish himself as the most dominant ONE World Champion in history with eight successful World Title defenses. Belingon, on the other hand, worked his way back up to contention, winning six straight bouts in exciting fashion to earn another shot at the ONE Bantamweight World Title. Belingon captured the ONE Bantamweight World Championship with a scintillating split decision victory over Fernandes last November at ONE: HEART OF THE LION in Singapore. It was a close match-up, one that saw Belingon’s elite striking take center stage as he overcame Fernandes’ world-class Brazilian Jiu-Jitsu. Now, “The Silencer” and “The Flash” will meet in the ONE cage for the third time to finally settle the score. In addition to the aforementioned bouts, multiple-time World Champions Demetrious “Mighty Mouse” Johnson and Eddie “The Underground King” Alvarez are scheduled to make their first appearances inside the ONE Championship cage. Alvarez joined ONE Championship in October, taking his stellar career back to Asia where he first made a name for himself. A multiple-time Lightweight World Champion, Alvarez seeks to become a ONE World Champion, but will have to go through a bevy of top lightweight contenders in order to achieve his goal. In his first outing for the promotion, Alvarez will face top contender Timofey Nastyukhin of Russia in a quarter-final bout of the ONE Lightweight World Grand Prix. Johnson, meanwhile, is widely-considered the pound-for-pound best mixed martial artist in the history of the sport. He joined ONE Championship in late October and, alongside Alvarez, appeared in Singapore the following week for the Global Martial Arts Summit, Global Martial Arts Awards, and ONE: HEART OF THE LION. Johnson’s opponent for his first ONE Championship bout will be Japan’s Yuya “Little Piranha” Wakamatsu. It is a quarter-final bout of the ONE Flyweight World Grand Prix. The rest of the quarter-final bouts of the ONE Flyweight World Grand Prix will be held at ONE: A NEW ERA. Danny “The King” Kingad of the Philippines is set to take on fellow former ONE World Title challenger Andrew Leone in a quarter-final bout of the ONE Flyweight World Grand Prix. In another tournament matchup, former ONE Flyweight World Champion Kairat “The Kazakh” Akhmetov of Kazakhstan will lock horns with former ONE World Title challenger Reece “Lightning” McLaren of Australia. Also in the ONE Flyweight World Grand Prix, Tatsumitsu “The Sweeper” Wada of Japan will share the cage with undefeated Brazilian standout Ivanildo Delfino. There will also be an exciting ONE Super Series showdown on the card, as Muay Thai legend Yodsanklai IWE Fairtex squares off against Dutch World Champion kickboxer Andy Souwer. Yodsanklai is coming off a stunning performance in Kuala Lumpur at ONE: DESTINY OF CHAMPIONS. The martial arts veteran finished opponent Luis Regis with three rapid-fire uppercuts that drew a chorus of cheers from the crowd. Souwer, on the other hand, is one of the most internationally-renowned striking superstars ever to emerge from the Netherlands and is a two-time K1 World MAX World Champion and It’s Showtime 70MAX World Champion. A tough test awaits Japanese veteran and former ONE World Title challenger Mei “V.V” Yamaguchi in her homecoming bout as she is slated to face submission specialist and debutante Kseniya “White Tiger” Lachkova of Russia. Lachkova has won four of her last five outings by finish, making her a formidable foe for Yamaguchi, who looks to re-establish herself as a top contender for the coveted ONE Women’s Atomweight World Championship. Based out of Jakarta, Indonesia, Anthony “The Archangel” Engelen of the Netherlands aims to place himself back on the winning track against multiple-time BJJ World Champion Garry “The Lion Killer” Tonon of the United States. Tonon is one of the world’s most decorated grapplers, having won multiple tournaments across the globe. He is a former IBJJF World Champion, two-time IBJJF World No-Gi Champion, and four-time Eddie Bravo Invitational Champion. He made his professional mixed martial arts debut in 2018, winning his first three assignments in impressive fashion. Tonon now makes his way back to square off with Engelen in his fourth ONE Championship bout. On the other hand, Engelen made a successful return to the ONE Championship stage in 2018, finishing both Meas Meul and Jimmy Yabo in the first round. “The Archangel” looks to regain his momentum at the expense of Tonon after falling short in his first match this year. Rodtang “Iron Man” Jitmuangnon is one of the most recognizable names in the world of Muay Thai, capturing the Omnoi Stadium Muay Thai World Championship on two occasions. Known for his exciting Muay Mat style, which specializes in devastating strikes and always looks to charge forward to instantly inflict damage, Rodtang has beaten some of Thailand’s biggest Muay Thai superstars. Following his two impressive performances on the ONE Super Series stage, Rodtang eyes to inch himself closer to a possible ONE World Title shot by testing his mettle against two-time Muay Thai World Champion Hakim Hamech. Hamech made quite an impression in his ONE Super Series debut in September 2018, scoring an emphatic first-round knockout victory over Japan’s Yukinori Ogasawara. In another ONE Super Series contest, two-time Muay Thai World Champion Panicos Yusuf of Cyprus is booked to lock horns with Mohammed “Jordan Boy” Bin Mahmoud of Malaysia. After his sensational debut against Australian Josh “Timebomb” Tonna this past January, Japanese striker Hiroki Akimoto looks to establish his first win streak in ONE Super Series. He takes on former WBC Muay Thai World Champion Joseph Lasiri of Italy. Tasked to set the tone for the evening is a three-round lightweight encounter between South Korea’s Yoon Chang Min and India’s Bala Shetty.